“The spice must flow” …Cinnamon is considered a spice. It is an additive to foods for taste, and also smell as it has a distinctive and sometimes strong odor. Cinnamon is produced from the inner bark of several trees. Sterling Systems & Controls, Inc. has provided process control/automation and an MCC (Motor Control Center) for a spice production operation. The control system provided in this food application consists of a UL listed NEMA 4X HMI Operator Station Panel with an Allen Bradley PanelView Plus Touchscreen running a Sterling Systems custom designed FactoryTalk View ME application, which interfaces to the Allen Bradley 5069 PLC located in a white food grade painted NEMA 12 main control panel. The control system is operated by entering setpoints on the HMI Touchscreen and using the start and stop buttons on the screen to start and stop the equipment in a predefined sequence as described below. A Pause button is available on the screen to stop the feeding equipment while allowing the remaining equipment to run. Security Access to the various screens and features of the control system is controlled via two security levels; Operator and Administrator. Operator security access includes having access to start, stop, and pause operations but cannot change process setpoints. Administrator security access includes having complete system wide privileges. Alarm history screens record all alarm descriptions that may occur with event times and alarm acknowledge times. The Alarm history screen is available at the Administrator security level. An Alarm Summary is visible on all process screens in the header of the screen. Equipment Status screens show the current status for all equipment controlled and monitored by the control system. The equipment status screen is useful to maintenance personnel and for troubleshooting. System parameter screens show all global parameter values for all equipment controlled and monitored by the control system. These parameter values are set during system commissioning. All parameter timer values are expressed in seconds and allow up to one decimal place. Example “00.0 sec”. 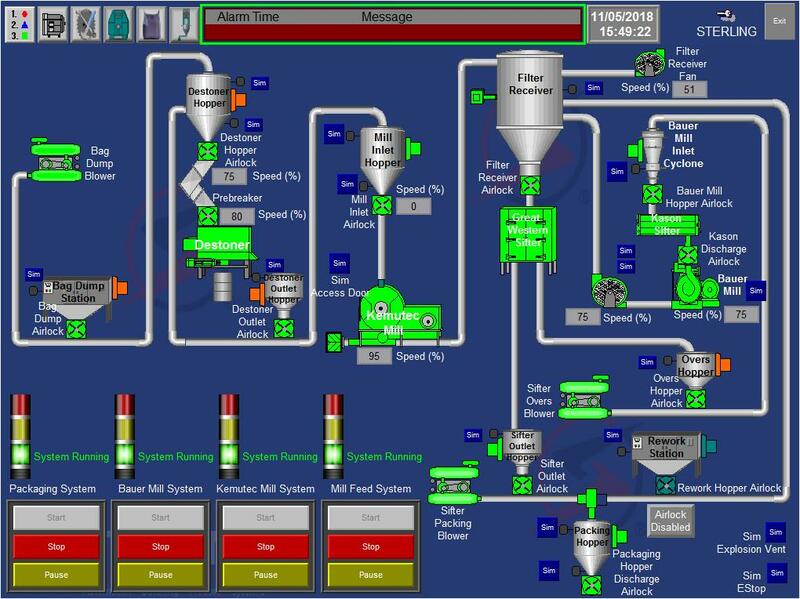 The process screens graphically show all equipment controlled by the system. Equipment is shown Green when running in automatic mode, Light Blue when running in Manual Mode, Dark Gray when turned off, and flashing Red when faulted. Temperature, amperages, and other running process data are shown on these screens. Manual/Off/Automatic control of each piece of equipment on the process screens is also available. 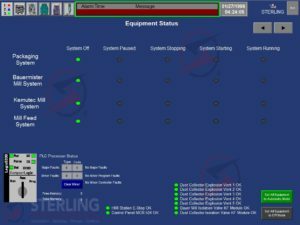 In addition, Sterling Systems provided a Motor Control Center including all motor starters and VFD’s for the required equipment. This is an Ethernet MCC, a low voltage model, NEMA 1G (with gaskets) rated enclosure with a 1000 amp incoming main service with a main circuit breaker with maintenance mode, 65KAIC rated buss system. Each VFD or motor starter bucket is equipped with a pull-lever disconnect and circuit breaker protection. The Motor Starters utilized are NEMA rated with solid state overload relays, E300 with Ethernet/IP communications. The individual buckets are equipped with 1B wiring, which consists of pre-wiring from the motor starters to terminal strips to help save installation time and maintenance costs. Power terminals are installed for all Size 3 starters and below. A 15 KVA step-down transformer was provided, 120 volt circuits not being readily available in the production plant. A 100 amp panel board/control power panel is installed in the MCC and has 18 single pole spaces. 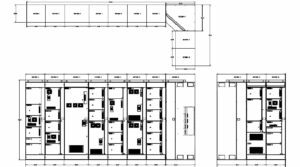 The 18 spaces have been filled with fourteen (14) circuit breakers, two (2) 30 amp 120VAC single pole breakers and two (2) 20/30 amp 240VAC two-pole breakers. Each MCC bucket is supplied with a 120VAC step-down transformer. The MCC is also equipped with an Ethernet power supply bucket, and two (2) MCC buckets that house the Ethernet switches. These are strategically located for cable connections to the individual buckets. Sterling Systems & Controls, Inc. has 45+ years of experience providing efficient solutions for process and electrical control, automation, process equipment, batching, micro, minor and bulk weighing, and bag unloading / filling systems. Sterling Systems’ designs utilize the latest technology to provide specialized data management, raw material management, along with production data tracking. For more information contact Sterling Systems & Controls at 1-815-625-0852 sci@sterlingcontrols.com, and at www.sterlingcontrols.com.